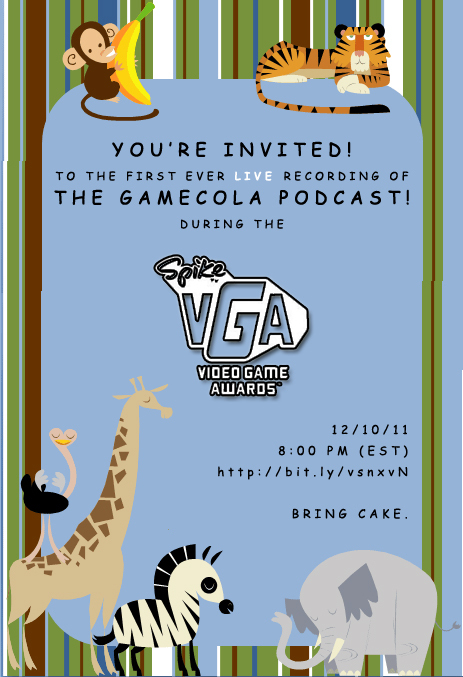 Watch the VGAs LIVE with the GameCola Staff! The recording starts at 8PM EST! Make sure to join us over at uStream. Edit: The recording starts at 8PM EST! Make sure to join us all here. Because it can’t possibly make the VGAs any worse, right? Be sure to be there—not only will it be our first-ever LIVE broadcast, but you’ll be able to join in, right there, from the comfort of your own computer chair! You’ll be able to chat with us and other GameCola fans LIVE in the uStream chatroom, and if you register for a (free) uStream account, you’ll be able to call into the show at any time. Here’s the link to the stream, in link form. Be there at 8:00 PM, Saturday night! And if you’re not at your computer but you have a smartphone there is a Ustream app available. You can listen to us while you’re away from your home and when we’re done you can just use it to watch puppies and kitties. I can’t wait for the contest that really matters: the 2011 GameCola Videogame Awards! @Daniel: Right?! Forget Skyrim; Game of the Year is definitely going to some game that no one else but us actually likes.